■2/3 PHONO. 3/4 LINE, 1 balanced MIC and 2/3 CD inputs. ■ Sources select, gain adjust, channel cue and channel fade for each channel. ■ Bass, Mid and Treble equalizer for each channel. ■Accurate beat LED for easy crossfaders. ■Channel assign and signal switch. 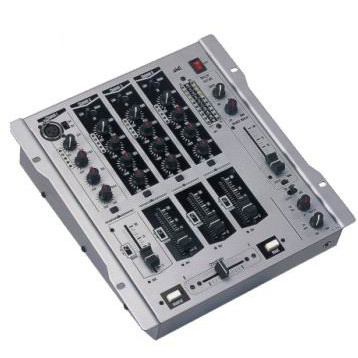 ■The handle of crossfader feels comfortable, it is easy to replace. ■Reverse control and boost control. ■2 stereo outputs, 1 stereo REC output. ■Stereo balance control for main out. ■MONO/STEREO select (only for AK3, AK4). ■LED display of double 10 diodes for main out. ■Monitor selector and cue pan control. ■Soft-touch rubber knobs for better control.